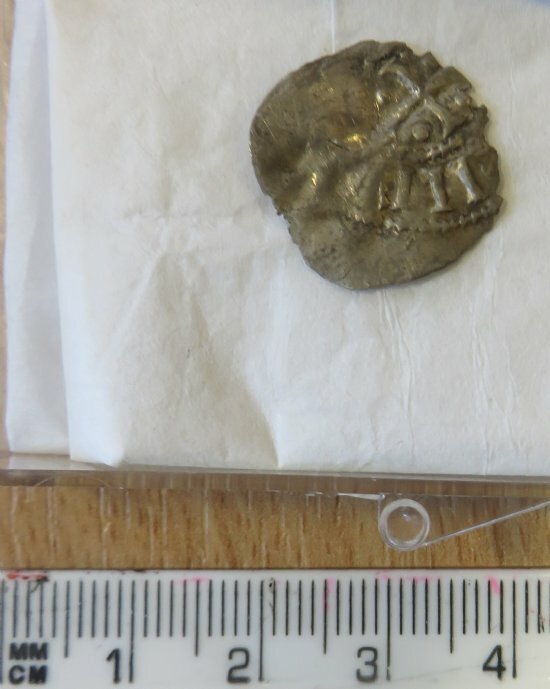 This silver coin was found recently at Kilbeg on the Sleat peninsula of Skye. It is a silver denier of Heinrich II, Emperor of the Holy Roman Empire, minted between 1002 and 1024, probably in Cologne. This is an unusual find in a number of respects. Scotland at this time did not mint its own coins, nor do we generally find foreign coins circulating here as we do in later medieval times. The only coins we tend to find in northern Scotland at this period are from Viking hoards, where they are sometimes accompanied by hacksilver and objects. Coins from the Germanic Empire are found in a number of Viking hoards of this period in Scandinavia. In Scotland, there are fewer Continental coins in the Viking hoards, and where coins occur, they tend to be from England, especially from the 11th century onwards. However, there are relatively few 11th century hoards in Scotland, with only the Tarbat, Portmahomack hoard dating to c. 1000 from the Highlands. This too interestingly had Continental coins, though not of Heinrich II. There are two Viking silver hoards containing coins from Skye, but they are earlier, dating to the 10th century. This coin therefore raises a number of questions. Was it part of a larger hoard? If it is a single find, this in itself is very unusual, since a coin on its own would not have had any purchasing power other than its bullion value. How would it have reached Skye – direct from the Continent or via a Viking raider, trader or settler, perhaps gathered in Scandinavia originally? If the latter, it would provide evidence of Viking activity in the area in the first half of the 11th century. It is also worth remembering that England was ruled by Danish Kings from 1013 to 1035. The coin was allocated as Treasure Trove to the Museum of the Isles in Armadale Castle.